Hello everyone, it's been a long time. I had a great time at WCSS 15, and it was a great motivator for me to get back to work on my Brat. 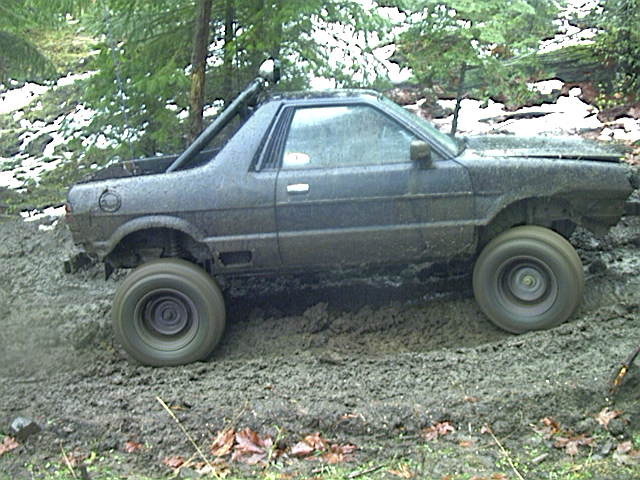 Here is a little history for everyone that may be new: I picked up the Brat in 98 after I got back from basic training. I started playing around with fixing it up, and then modding it a little here and there. 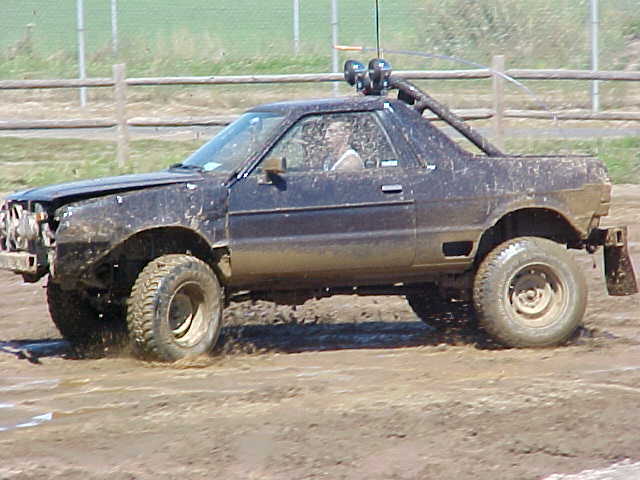 In 2000 after I got home from a deployment to Saudi Arabia the real modding started when I picked up an imported Ozified 4" lift and put some "bigger" tires on. 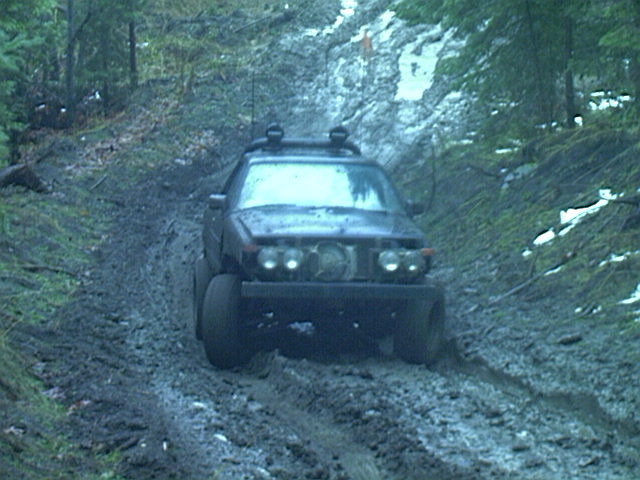 Around '02ish the USMB saw a great influx in the wheeling scene, we saw a lot of lift, tire mods, engine mods. 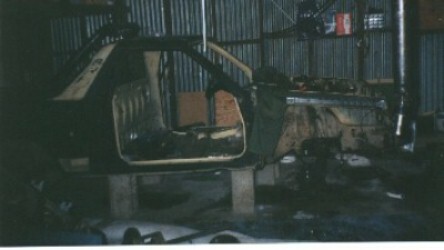 I took a lot the ideas and started assembling them together, and after getting home from Egypt in '03 I tore the brat down to just the body. 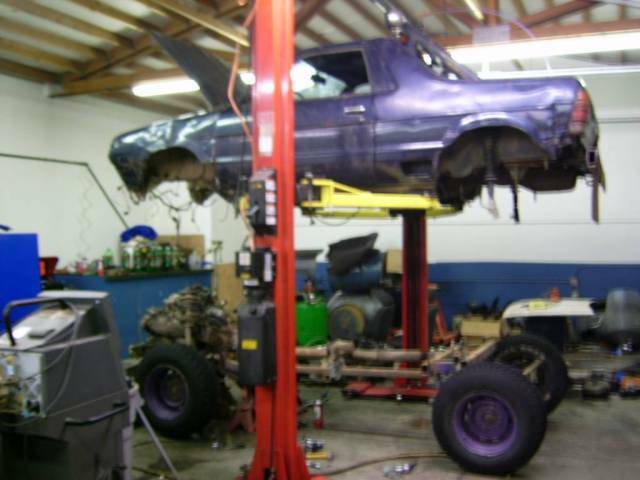 I built a 6" "framed" lift, to that I added a Nissan 720 pickup divorce t-case, a 5spd dual range trans fitted behind an ER27. 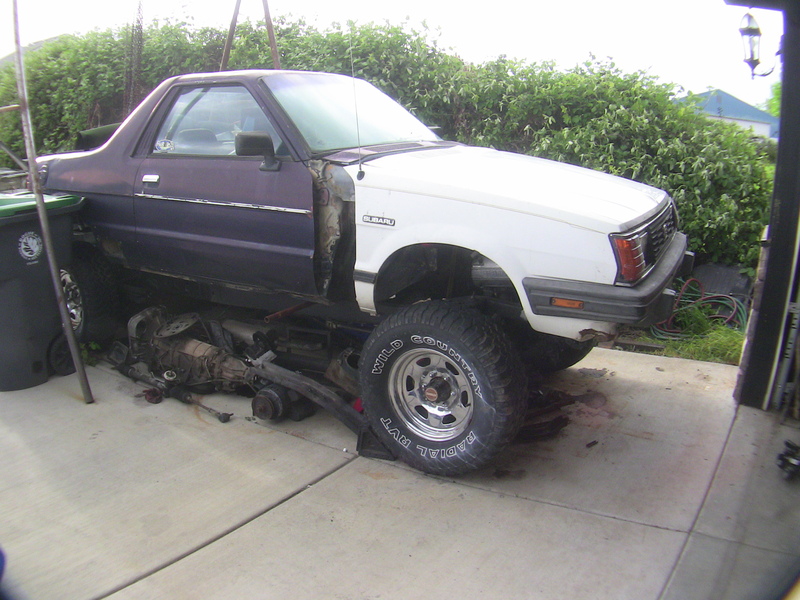 The bed was bobbed a little over a foot and I built whole custom "slide off" front end. 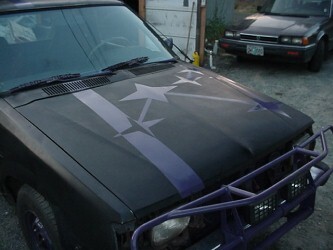 A year of tweaking and a couple coats of "Midnight Metallic Blue" paint and she made her way to her first WCSS (and my second), #6 in Hood River. She remained virtually untouched (no more modding) for over 6 years, with the only work being done was fixing what broke, which was of course every time I took it out I broke something. 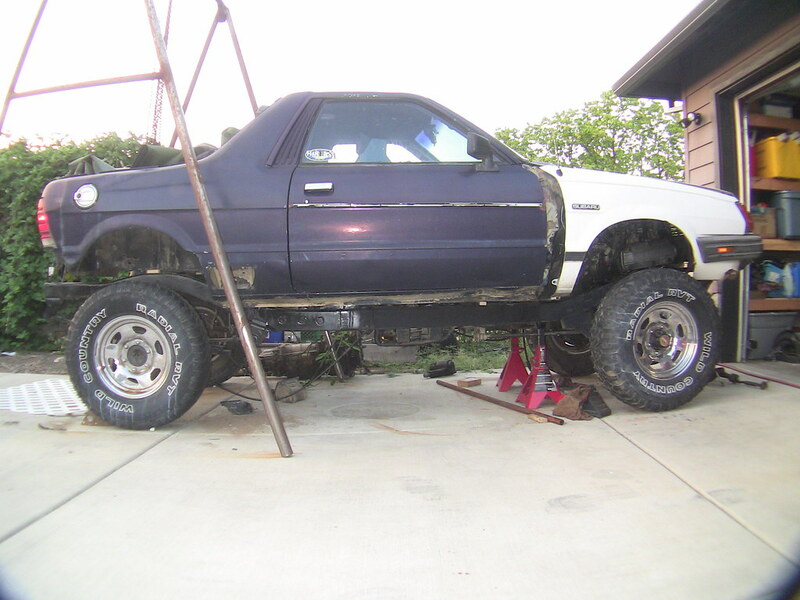 So in 2009 while I was in Iraq I decided that I wanted to make it more reliable, and able to handle more power, so I had my wife start looking for an early 80's Nissan 4wd pickup. 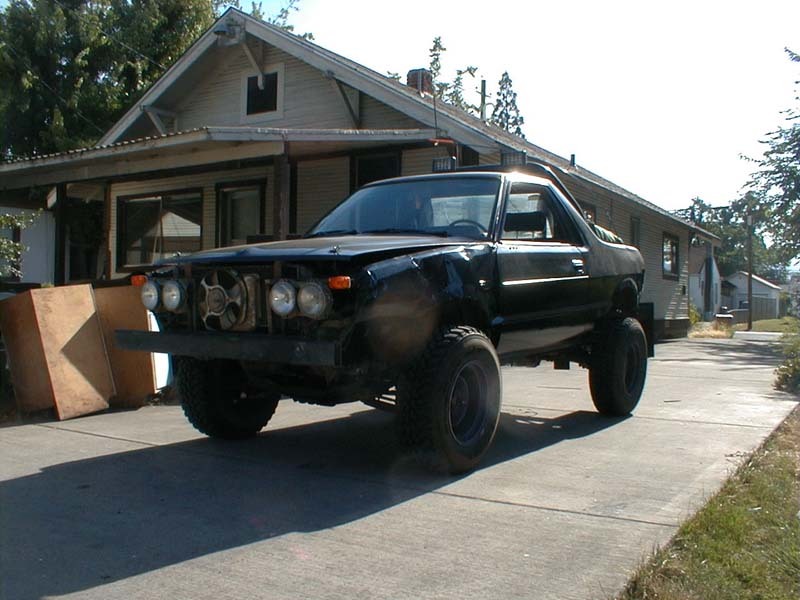 When I got home in 2010 I had an 84 Nissan sitting in the driveway right behind the Brat. 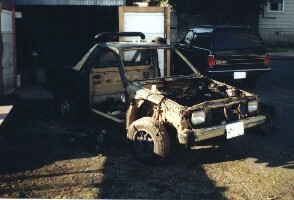 and then stripping apart the Brat. And that was where it sat for over a year. I got caught up with work, and other "hobbies" and doing a lot more "family stuff". 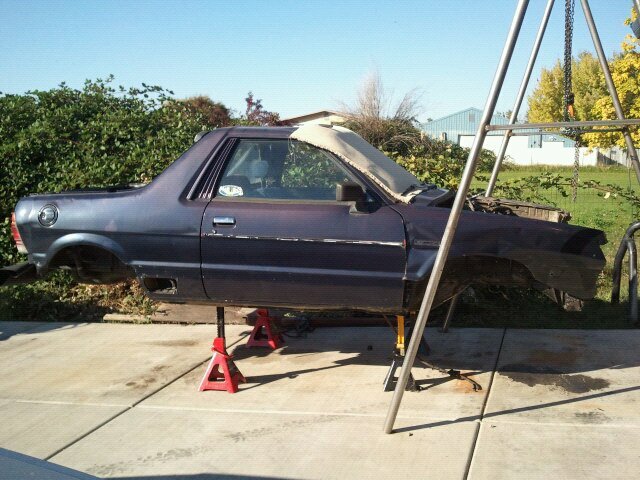 So the Brat just sat in the driveway, half assembled, waiting. Then the show came a long, and seeing all the other Roo's playing in the mud got something coursing through my veins that had been missing for a while. I came home on Sunday, and that night I started working. 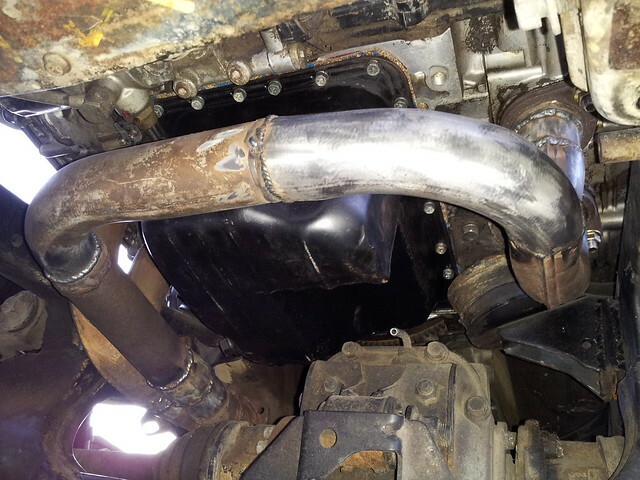 Got the newly formed oil pan bolted in, then started working on the exhaust.it is a bit tight moving around in there, so had to get creative with the plumbing there, finished off the header pipe this last weekend. Once the rain lets up I'll get back to it, I hope to fire the engine again before the end of the month, then only a couple page list of things left to do. Looks good. Not enough wheelers on this site. 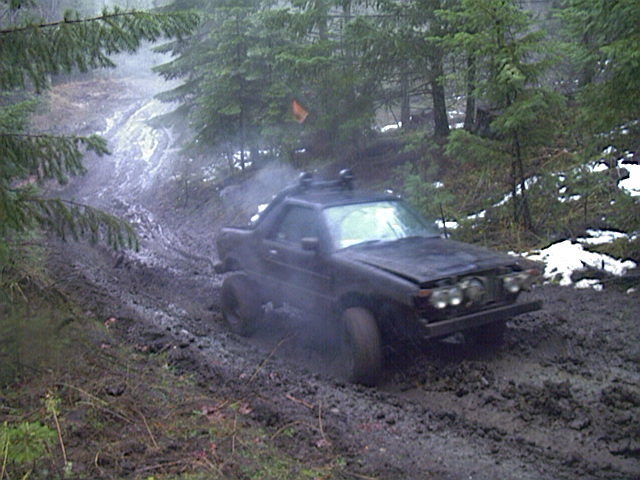 Good to see an off road built car getting some attention. 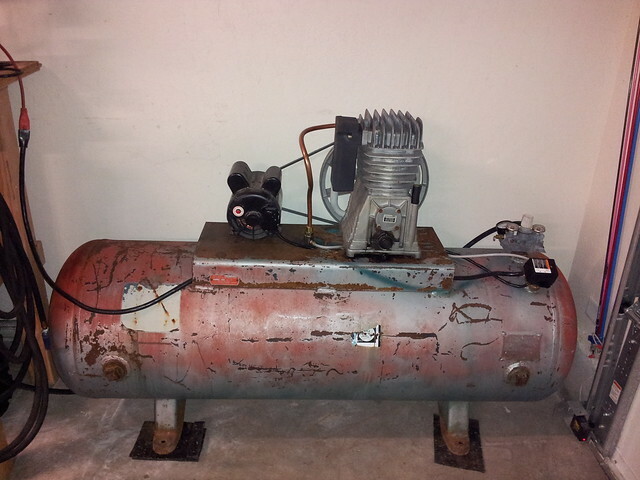 The tank was a craigslist find, came with a shot motor and the compressor. 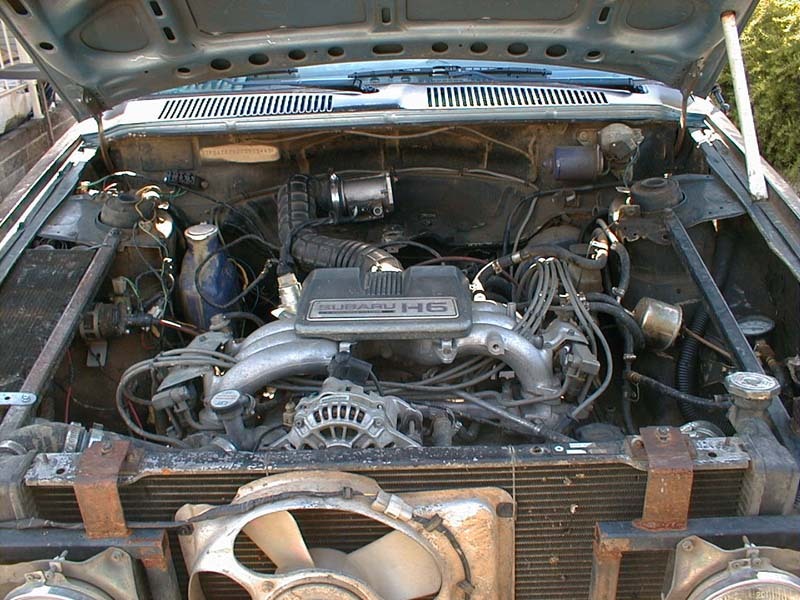 I cleaned up the compressor, repaired some gaskets and put some new oil in it. Then I built the new supply pipe, rebuilt the check valve, bolted on the motor off my little Coleman compressor then rebuilt the regulator block and put in new plugs, drain valve and added a line to my old 27 gal tank. So now I have the two stage pump putting out 150 psi and over 105 gal of reserve capacity. I can run the die grinder for a solid 35 min before the pump kicks on. 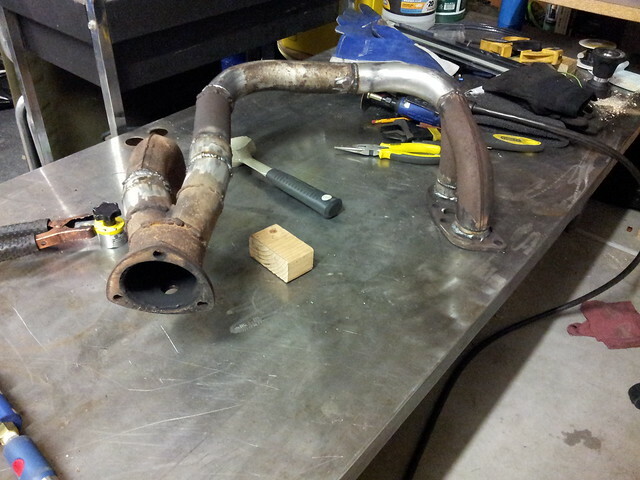 I got to getting the exhaust header pipe finished up. I found a "repair" kit for a toyota that had 4 studs with the same threads as the ER27, so two kits later I've got all new studs in. 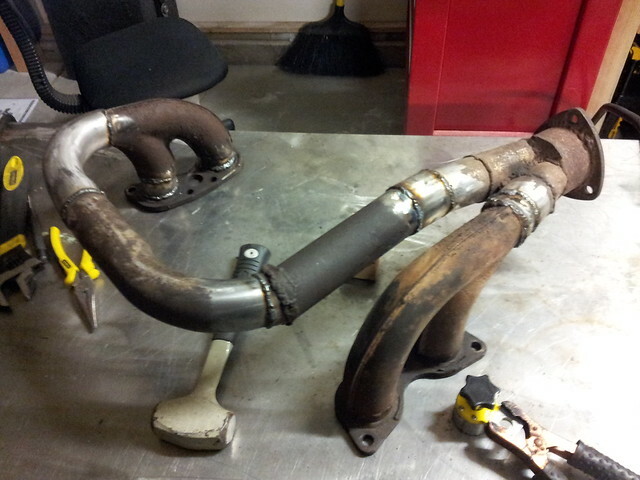 Then I got the pipe bolted up, and started working on putting together the mid pipe. One thing that I had been wanting to do is getting some fishplates made up and in place over where I had sectioned the frame back together. So a little .1875 sheet steel, a plasma, and an afternoon of waiting for the food to get done an people to show up got em done. 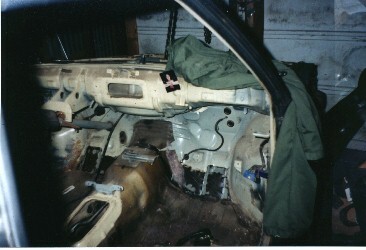 Also got the frame cleaned up a little better and some more sheet metal taken out of the front. Got a little bit of work done this weekend. 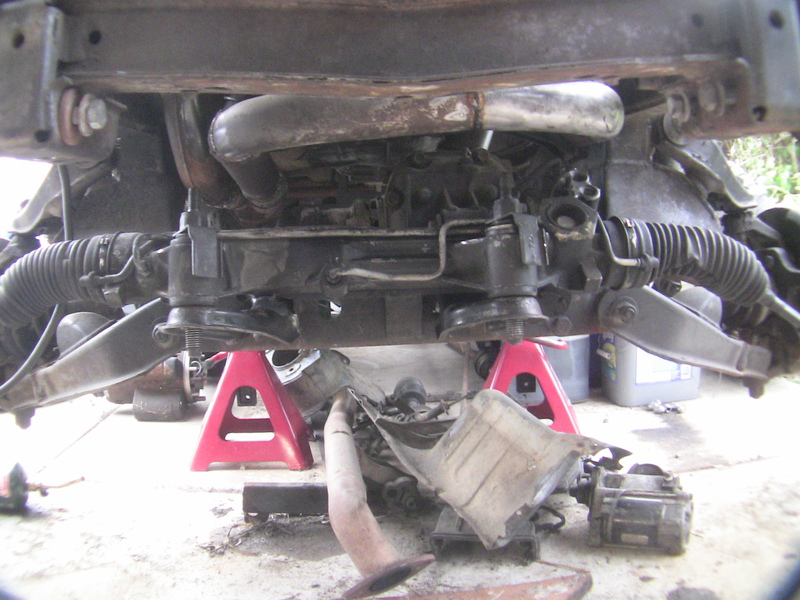 Started working on the steering set up. 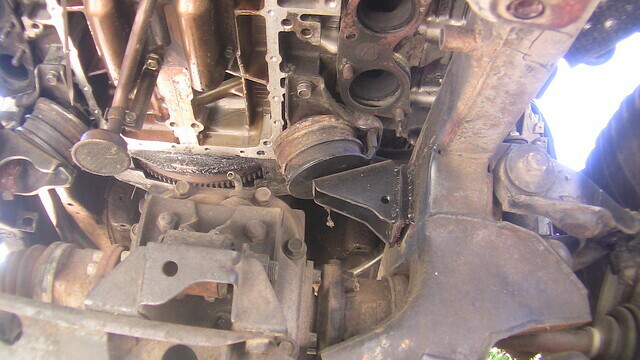 The intricate mating of a six cylinder boxer on an inline four frame does pose some interesting challenges. 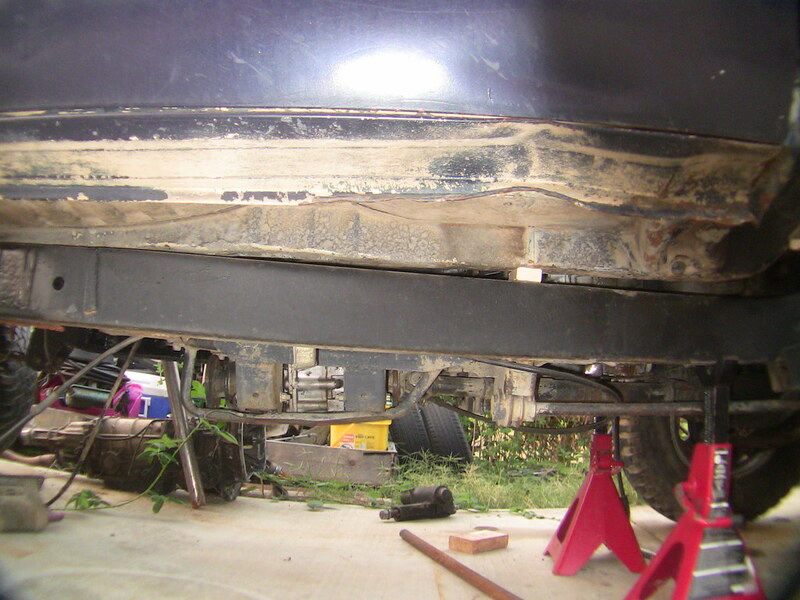 I want to use a power steering rack, but at the moment do not have one or a way to mount it yet. 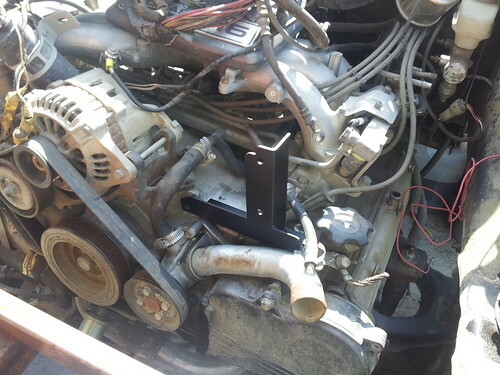 While I was at the wrecking yard looking for a rack I picked up some power steering pumps to tackle the mounting method, as the ER27 did not come with a standard engine driven pump. 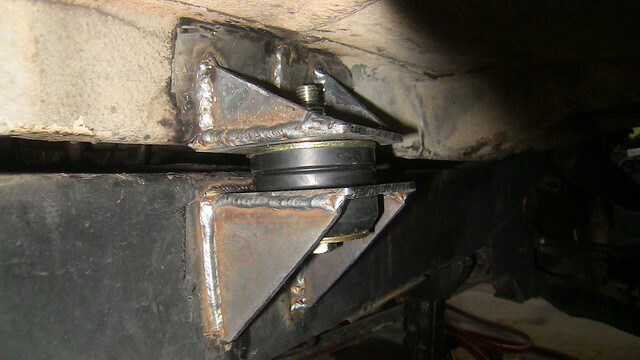 I started with some angle iron, fitted it to the block in the place of the A/c mounting location. 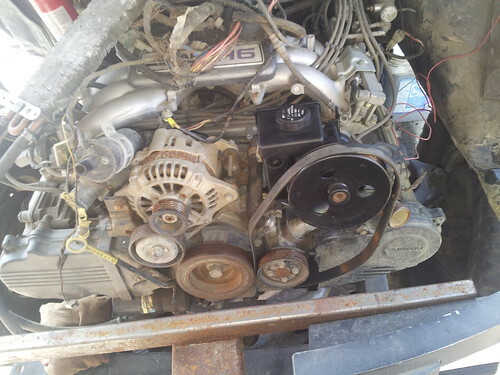 The pump is off a 91 Bonneville, has the right pulley and a pretty simple mounting scheme. 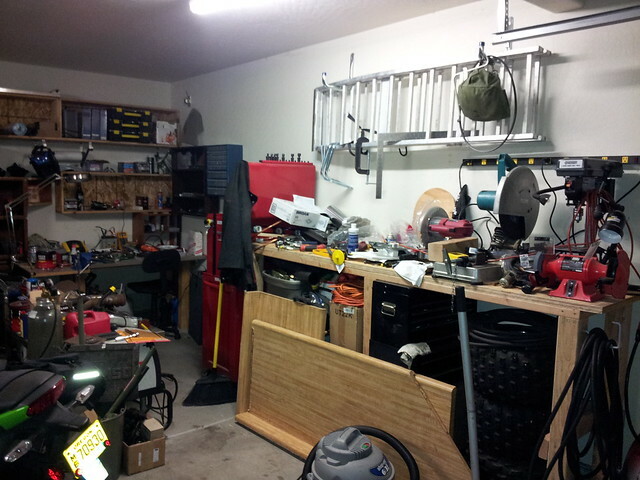 I still need to get a belt that will fit and then make sure everything is all plumb and even. 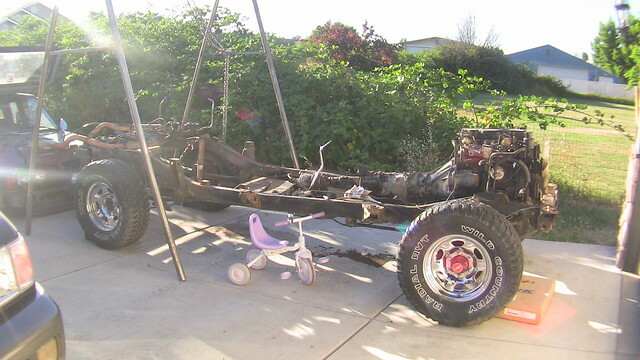 Next week hopefully I will get a rack in, and maybe even the body mounted to the frame. Some historical pictures that I have dug up. and of course, some action shots! 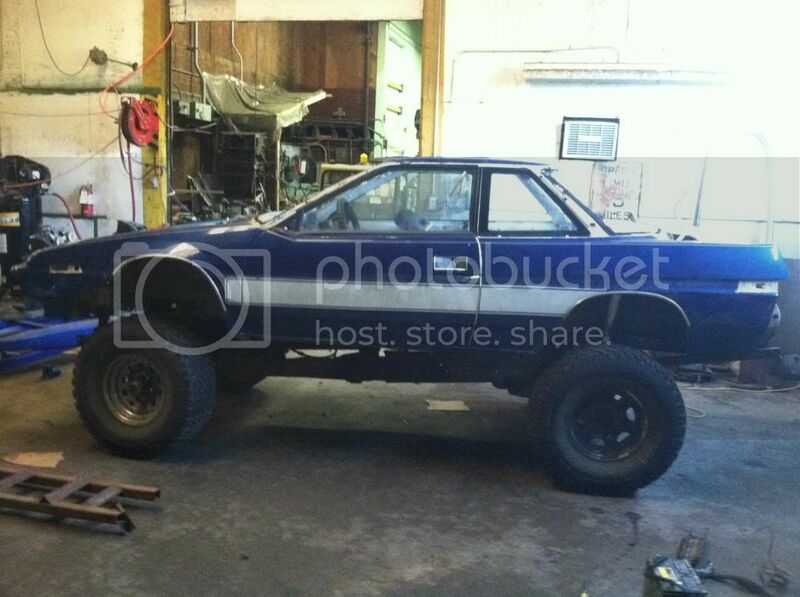 Did you invade my mind and take my idea,my vision for my 78 brat? 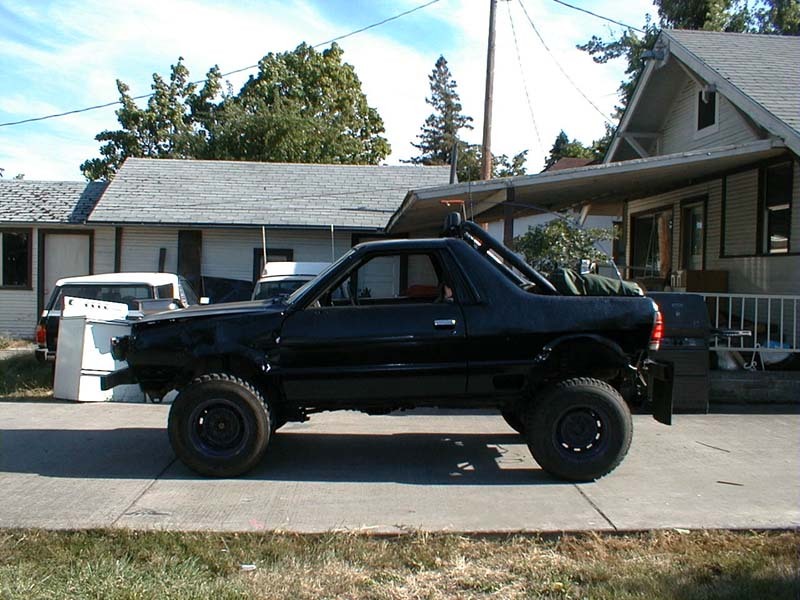 That is totally what I want mine to look like. It is possible I guess. I have been working it a long time though. 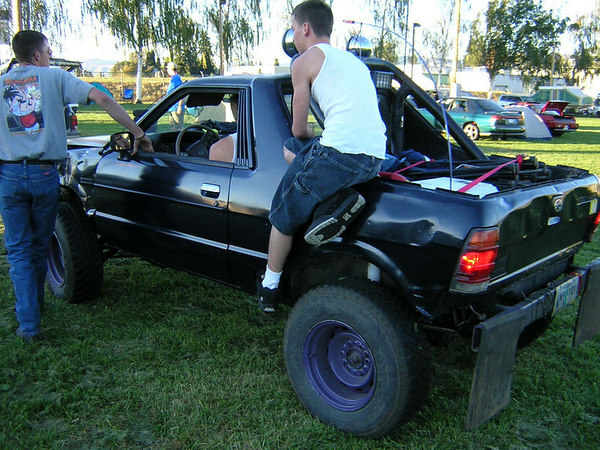 Why not a sammy frame with Yota axles?? 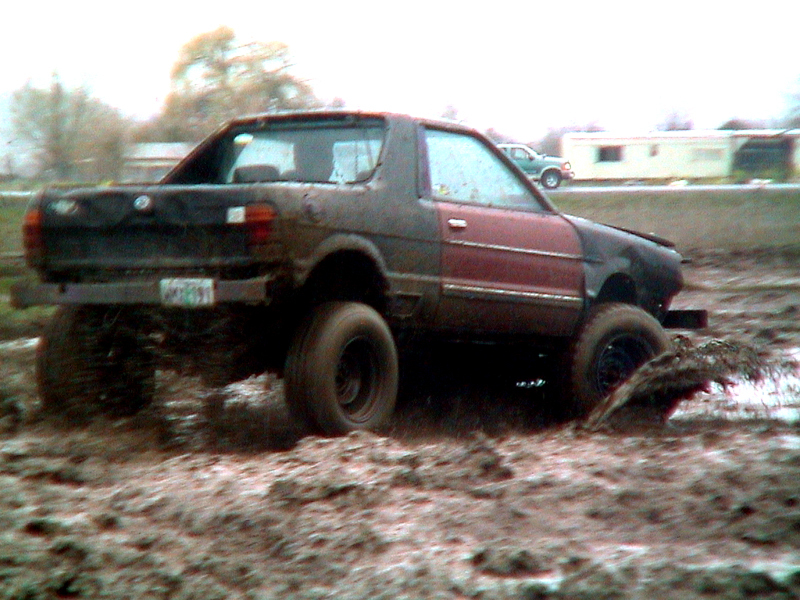 I really am partial to independent suspension. Really though, right now it is just a platform to work with. Once I have thing integrated and running than I have ideas for full independent with multi-link high travel stuff. I also went with the Nissan cause at the time Hitachi manufactured a lot of parts for both FHI and NMC, so to me it is like getting a kidney from a close family member, and not a random stranger. (although now that I do own a Toyabaru I have been flirting with the idea of adding in Toy stuff. 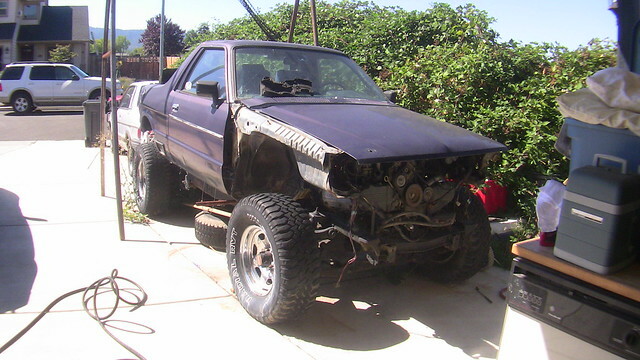 Like I am thinking of going with Supra diffs and axles). I do say though, that it does elicit some funny looks when you walk in to a parts store with a spreadsheet so that you know what parts you need for what vehicles. I have actually been keeping an eye on your post. Cleo is a really nice looking build, will be quite beastly when done. I can see us meeting up some time for sure, if not as a WCSS then possibly like a dunes run on the coast or something. Although you may be done long before me, I have so many irons in the fire, I rarely get the time to work on the Brat that I want. Keep up the work though, can not wait to see ya in action. Made it out to the U-pull it, spend most of the day crawling under cars and measuring their racks. (he he). 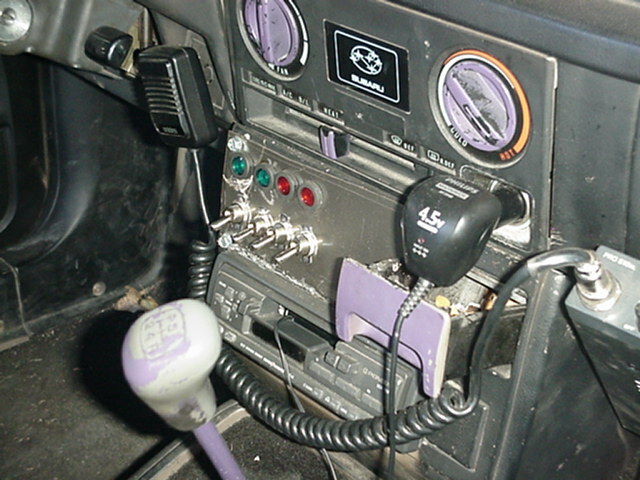 Settled on a 97 ford explorer, has a rack and pinion steering, forward mounted configuration, close to 50 inches across, and it mounts on a flat plane (easy to work with stuff that mounts to a flat plane, means that you can use a single plate to mount something, although I do not always choose that option). Got everything home just in time to get a little bit of mock up work done and start laying the base beads for the mounts. 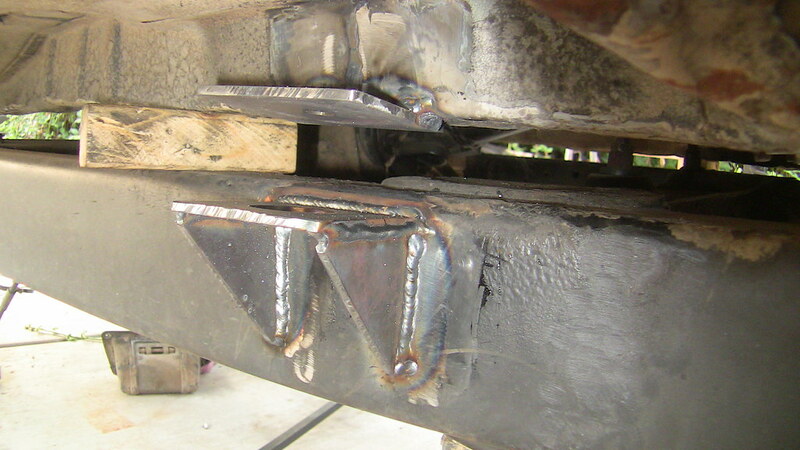 I am still going to lay in the forward rain that will go to the front cross of the frame, and this will also serve as the mount for the skid plate. Good start though, for a couple hours of work. Also got to spend some alone time time with the wife out in the u-pull it! I do tend to make a bit of a mess when I am in full fabber mode. I think I may have fiddled with the settings on my camera, these pics seem way bigger for some reason. 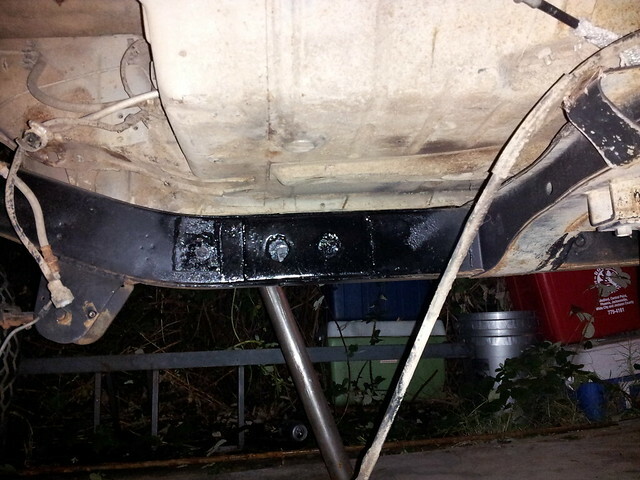 Also, initial mounting of the rack. 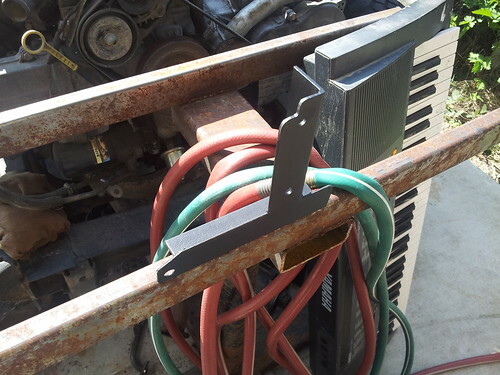 I am liking how this is coming out, simple mounting scheme, easy to work with and change out if needed, nothing what I had to do to get this thing out of the ford. 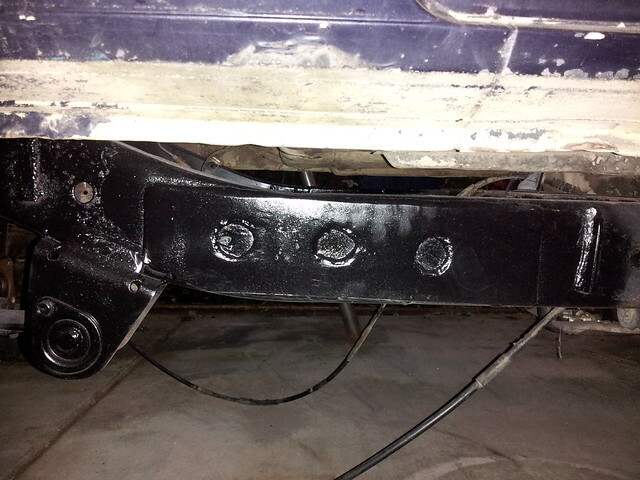 This is the base mounts, started life as an EA81 automatic trans crossmember. Worked well for repurposing to a new mount. The end of my day did get rained out though, I hope it clears up tomorrow so I can finish getting the rack mounted, then move on to the challenge of getting the shaft from the column to the rack. Pretty busy day! 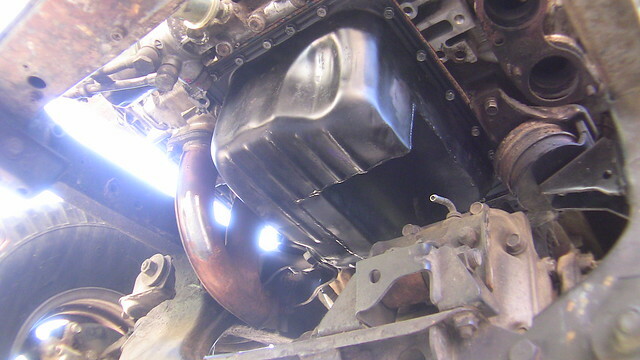 Fixed the blown out pump supply line on the turbo coupe, finished stripping the parts car so I can get a little more of my driveway back (for another project kicking off soon). Of course some Brat time too. 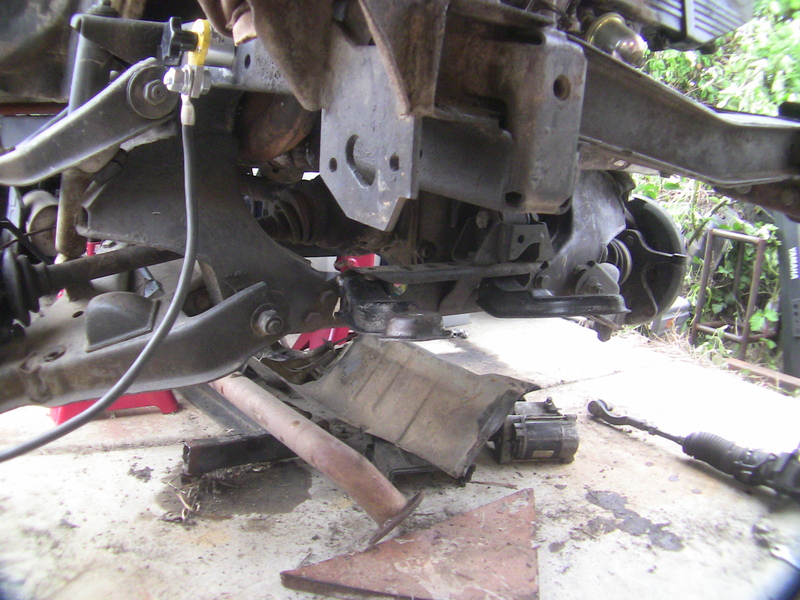 I did a little more work to the steering, took some measurements, got an idea of what tie rod ends to use (99 hyundai elantra?! ), and did a little cosmetic work. I am not settled on how much longer the nose is going to be, but I do not think that it is going to be this much, I am most likely going to bring it back a couple more inches, but that is where I had bolt holes that lined up, and it was good for doing some mock-up work. 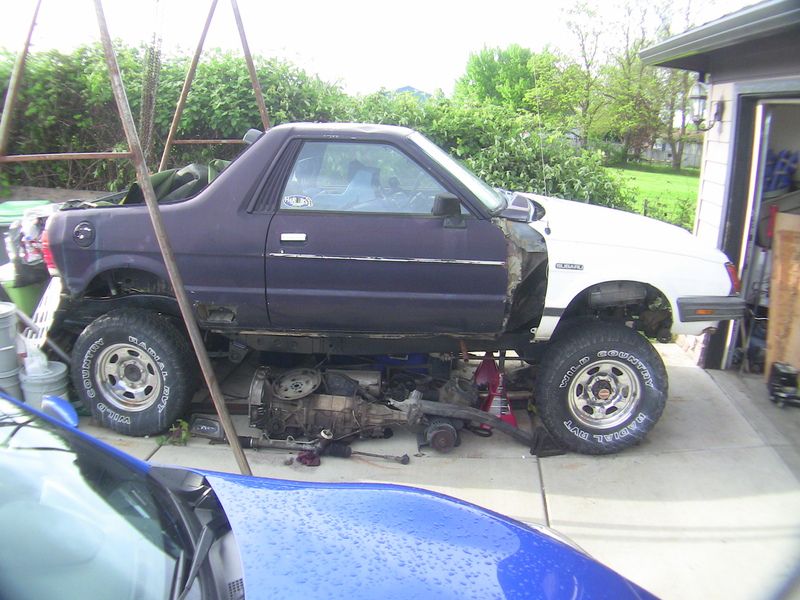 I like that is is starting to look like an actual Brat again, it might be a little longer, and somewhat wider when I am done, but all I really hope is that people do not ask me if it is a suzuki. It almost looks as if I have a cooler fetish or something, but I assure you they are great for storing parts in. That face, it is the one that I fell in love with 16 years ago. One that I have not seen in well over 10 years. 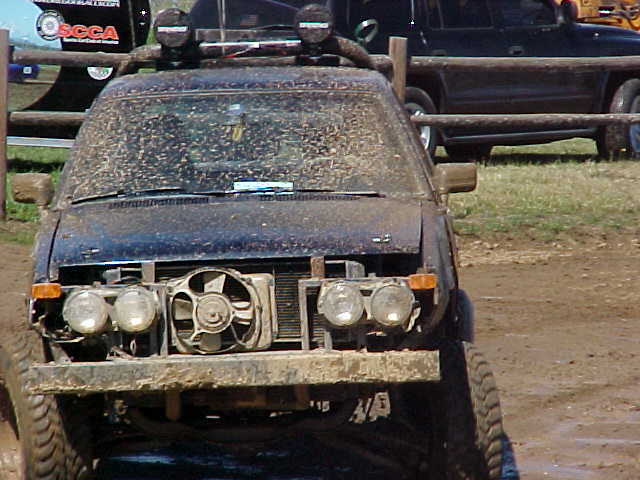 I can not even remember when the last time I had an intact front end was. All in all, good day! Nice. I don't know how i missed this thread either. 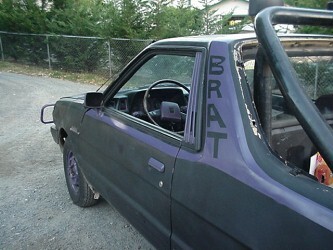 I have been pretty busy with wrapping up end of the summer stuff and now much of that has been spent on the Brat. However I have taken a little time and am getting some work done. The biggest thing that has been bothering me is that the body and still just resting on the frame. 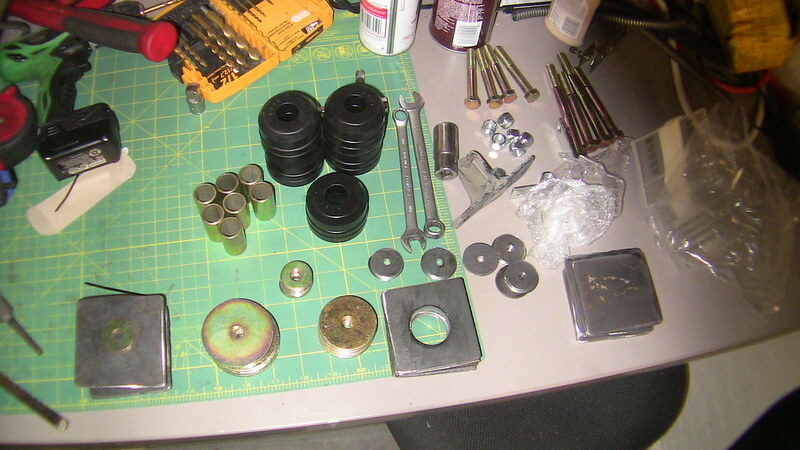 Well today I got everything squared up, and cut down to where I am happy with the final placement. 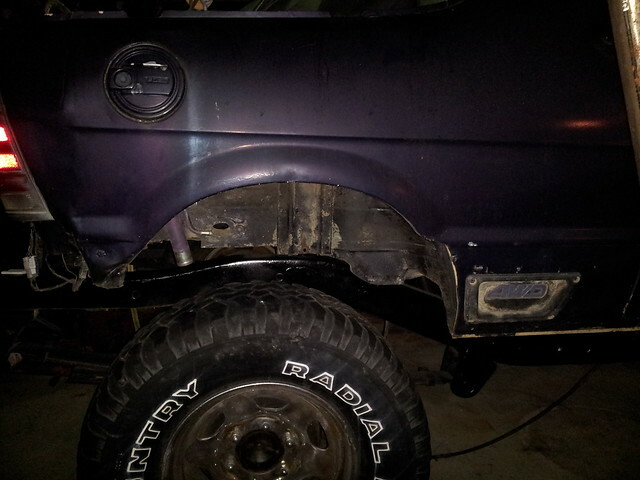 This weekend should see me getting all the mounts welded in. 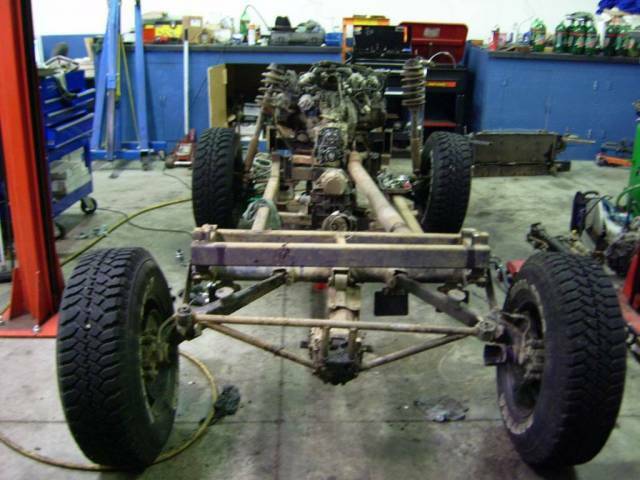 Then it is on to more pressing issues; like wiring up the engine, mounting a fuel tank, and making some fire! Pics or it did not happen? I still need to get the gussets cut out, but that is just a real quick couple dozen triangles. Looking forward to getting this done, it is a pretty big step that leads to a lot of other parts that can fall in to place. Just found this thread as well. Thing looks mighty sweet! keep updating us. Got started on the mounts. 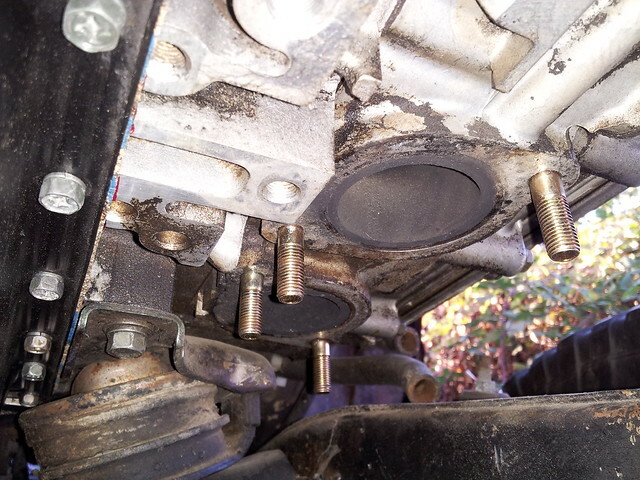 Some how I forget to cut out the gussets for the upper mount. Of course I am all out of oxygen to boot. Trying to steal time here and there, too many other things to get done before the rainy season hits. Anyway, before I digress, on to the pics! I am also starting to make videos of my work. I have not gotten in to doing any serious editing and stuff yet (mostly cause I still have not picked up a good program). However it is on the list. Most likely be a winter time activity. 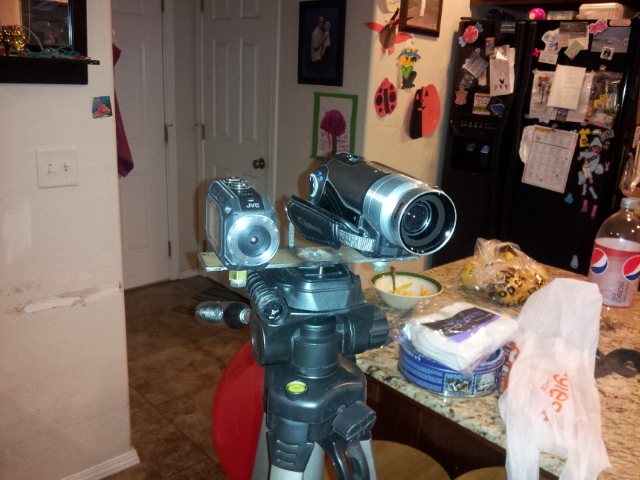 I did fab up a dual camera mount for my tripod, so I can do real time and time lapse at once. 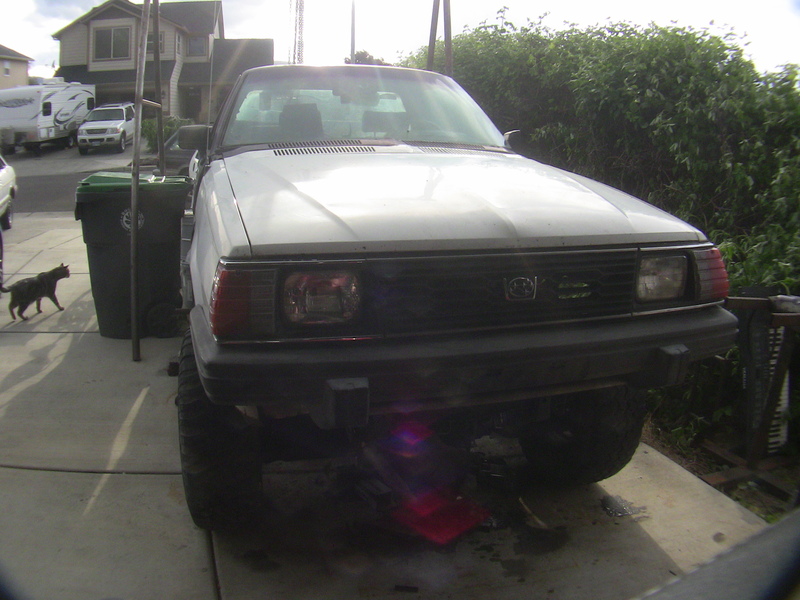 And a quick time lapse of the front body mount going in. This is about 30 minutes real time. My internet was down for a couple of days, so to kill the boredom I spent some time digging through some old CD's I had found out in the garage. 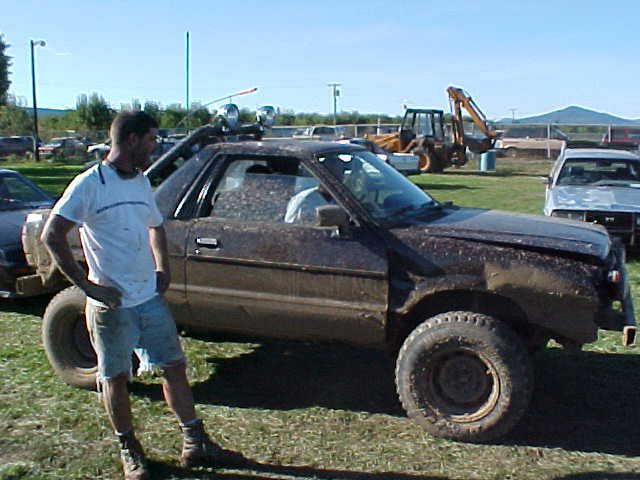 Dug up some really old pictures of my Brat, 1998 to about 2004. 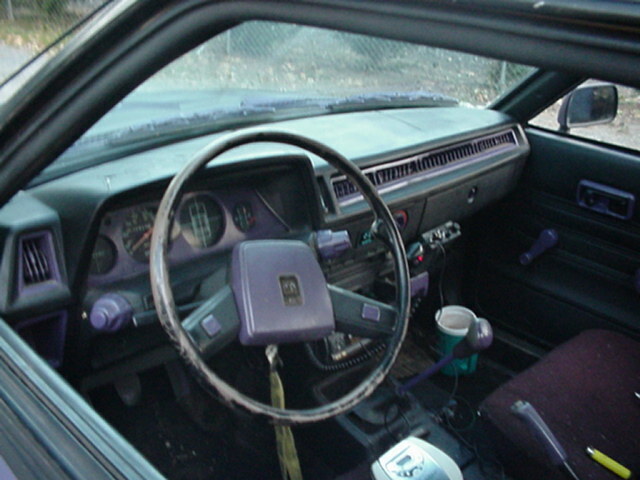 Shows some of the early changes that took place. Pretty neat to reminisce. Here she is when I brought her home. 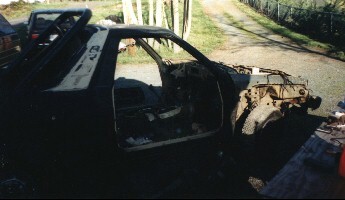 She had been vandalized, to include set on fire. 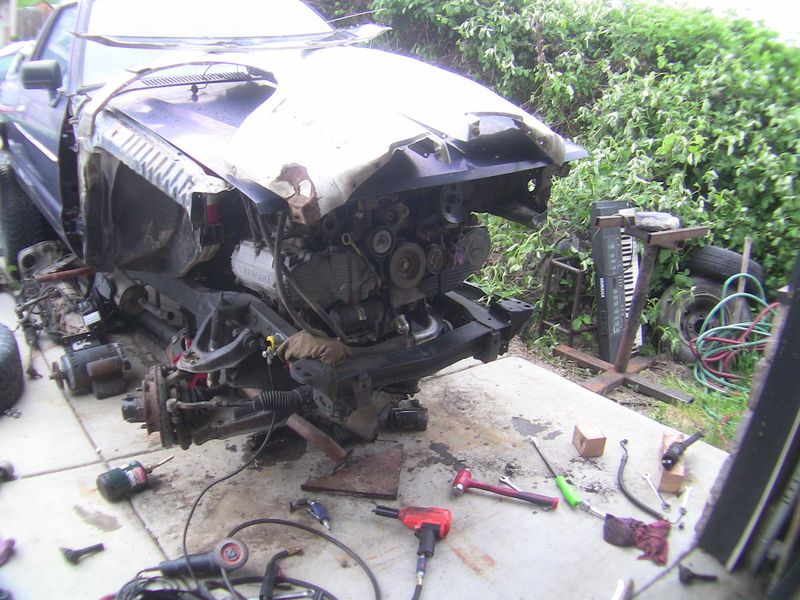 But I rebuilt her. 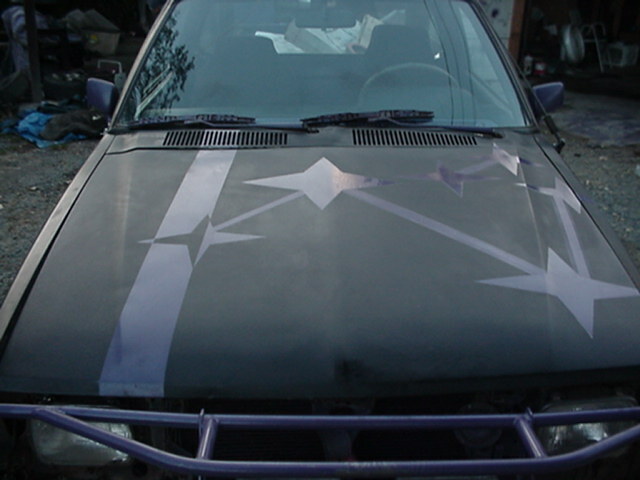 Here is when I first started playing with paint schemes. Steering sure is a bugger. 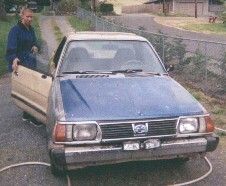 It is not something that you want to half(donkey), and have it throw you in to a ditch or traffic because it broke. So it is something that I have been fighting with for a while. 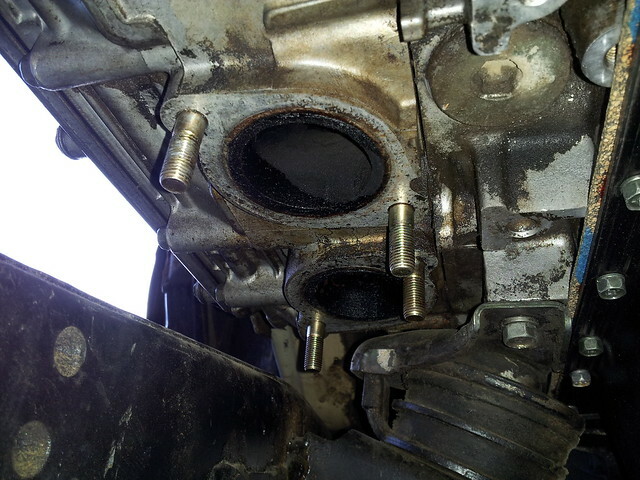 One of the biggest problems is that the stock steering box was bumped out of the way in preference of a flat 6 head. 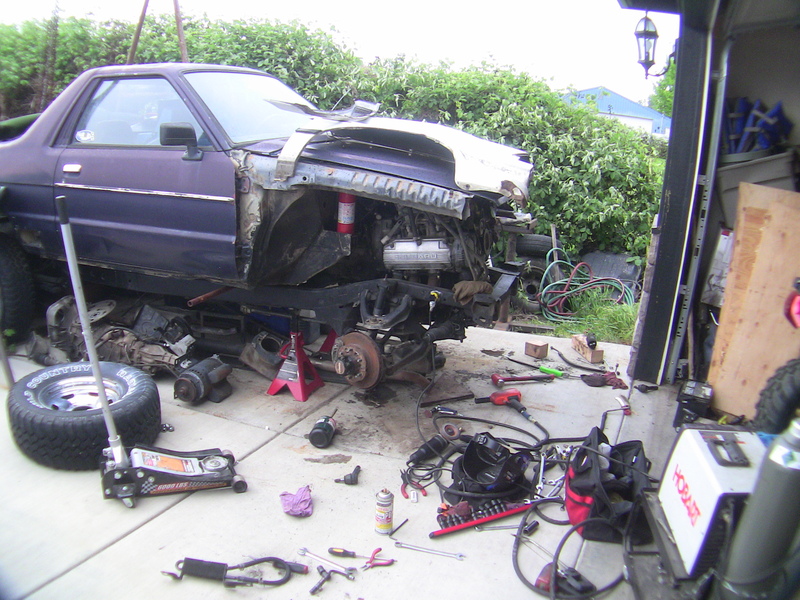 I started with a saturn rack, in rear configuration, and that proved to have issues with space involving the exhaust, torsion bars and front diff. 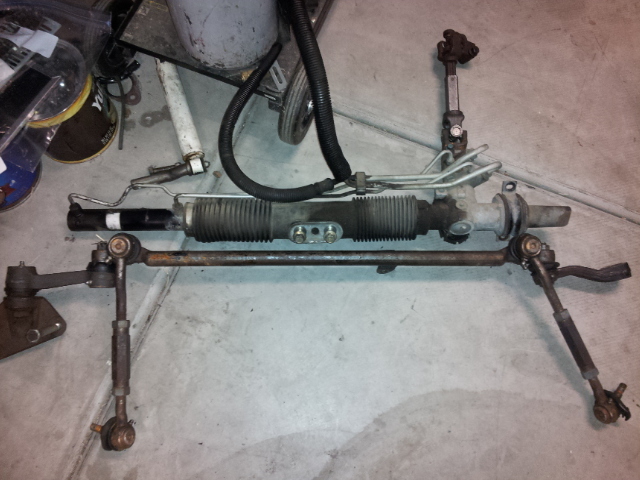 So I moved on to an Explorer steering rack, in front steer configuration. 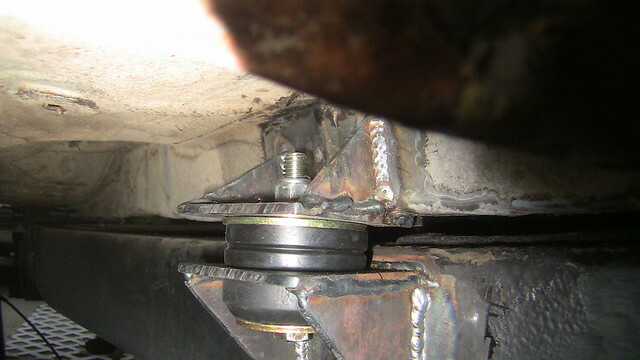 This mounting served easier, but the connection of the column to the rack proved to have a serious problem in that I would need at least 4 u-joints to make it work. Also I had forgotten some of my basic geometry and physics when dealing with this sort of thing. Ackermans principle and bump steer. 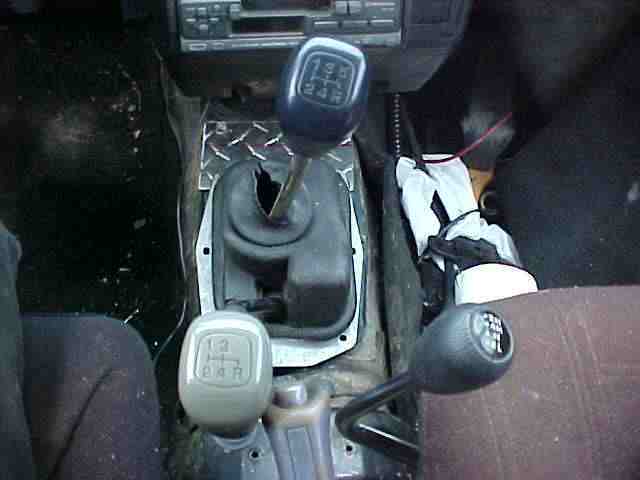 In order to make the steering work right I would need to preserve the already engineered aspects of the steering. 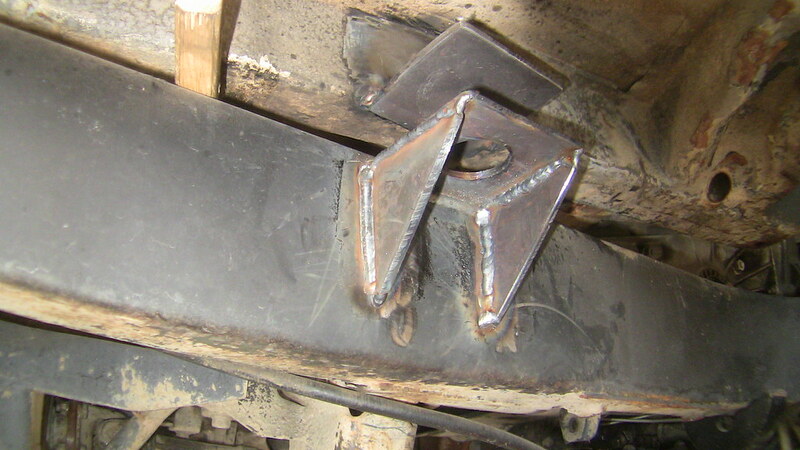 This includes the length and angle of the stock tie rods. 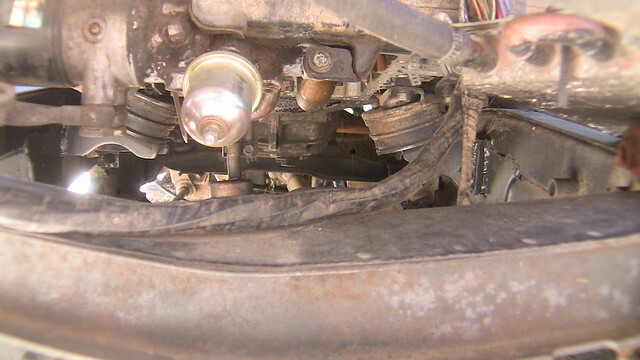 Now the Nissan used a steering gear with idler and pitman arm connected to the crossover link and two tie rods. After tons of late nights looking on the internet at different steering systems I had almost settled on getting a full hydraulic system (read very expensive). While a full hydro is not illegal in the State of Oregon, I did not know the regulations in Washington or California and was thus a little wary of going this way. So back to the net. 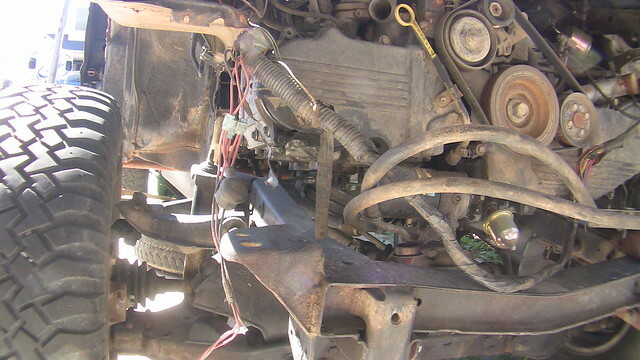 More research let me to some hot rod forums, as they have steering gear systems that sometimes people convert to R&P, and this lead me to the GM K (or was it J?) 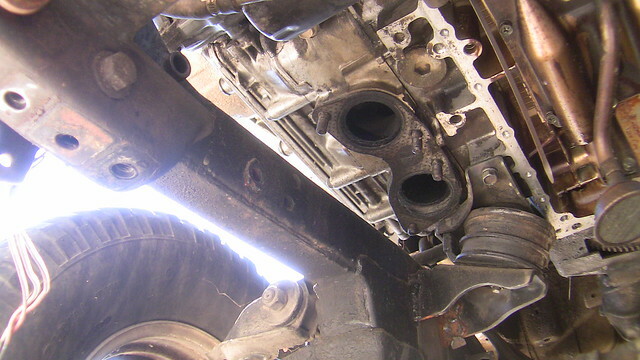 body steering racks. 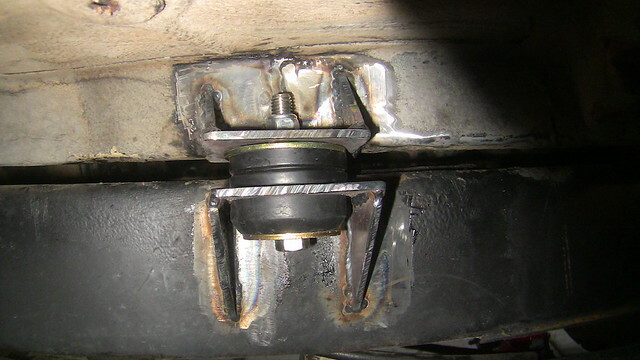 These use a center tie-in configuration and allowed the hot rodders to make up their own center link and tie rods to fit the application. So after some hunting in the local yard I came across a 95 Grand Am with said R&P in it and now it is sitting in the garage. I spent the day pulling out the stuff I had already started to weld in (and of course ran out of acetylene and the store is closed till tuesday) but luckily the explorer stuff is all in the front and the GM rack is a rear steer rack (my preferred configuration) so I will be able to at least start mocking up mounts and stuff this weekend. I am thinking that building a mount to use the nissan centerlink bolted to the R&P should solve my ackermans and bump steer problems. We will see though. 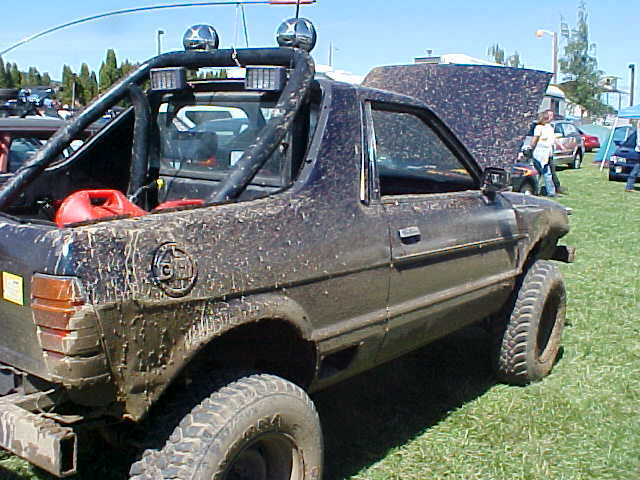 In any case, it is fine, honrable and prctical hobby to work on a Subaru, especially a Subaru Brat !! !